In Hinduism and Buddhism, the mandala is seen as a very spiritual object. They are found amongst the most ancient art forms created by human beings. 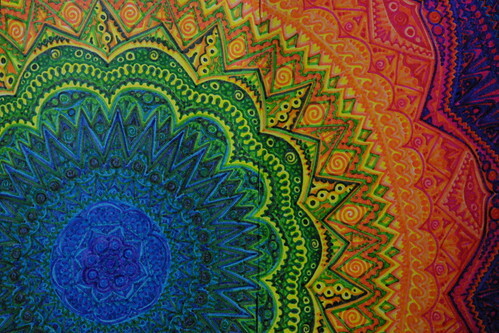 The most commonly known mandala design is made up of a square. It contains four gates with a circle centred in the middle. The mandala represents an imaginary palace that is contemplated during meditation. The purpose behind the symbolic mandala is to transform the mind. To turn people into enlightened ones and to help assist with healing. The Aztec mandala originates from the Aztec culture. The mandalas were used as a method of written communication with symbols. The Aztec mandala is a design which has great meaning. The flower mandala is thought to bring spiritual enlightenment. Formed with overlapping circles the flower mandala truly is beautiful. Mandalas have existed for many centuries. Over time new forms are created, a fairly new one is the popular love mandala. A brilliant representation of the love and bond between two people. The normal circular shape of a circle replaced by the shape of a heart. Mandalas are becoming more popular by the minute. They can be used in different ways. Change the feel of a room with vinyl wall art. Explore your spiritual side with the Indian Spiritual Mandala Vinyl Wall Art Sticker. Bring the sunshine straight to your walls with the Geometric Sunshine Mandala Vinyl Wall Art Sticker. Use the Blue Mandala Vinyl Sticker for Macbook to make your Macbook the talk of the town. 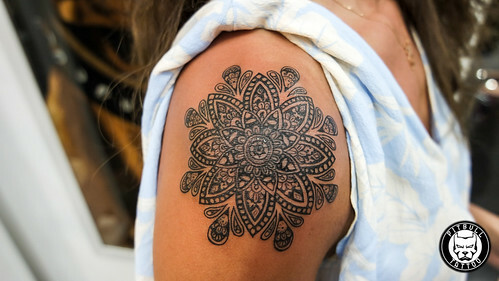 Tattoos have always been popular and flower mandala tattoos are seen more and more. It’s become very well-liked and in demand. Mandalas aren’t just for adults looking for tattoos, mandala colouring books are popular amongst kids too. A fun way of creating a colourful patterned picture.